You’re probably already familiar with our Metro T-Shirt pattern, right? It’s our classic semi-fitted T-shirt with a not-too-high and not-too-low neckline and short or long sleeves. I wear my Metro Tee with pencil skirts, jeans, under jackets, etc. We all need a few tees in our wardrobe. But sometimes you want a tee that’s a little less fitted and more boxy. I started wanting to make this pattern when I was designing the Girl Friday Culottes because it has such a contemporary silhouette. I find boxy tees to be really flattering. Thus, the Bento Tee. Bento box. 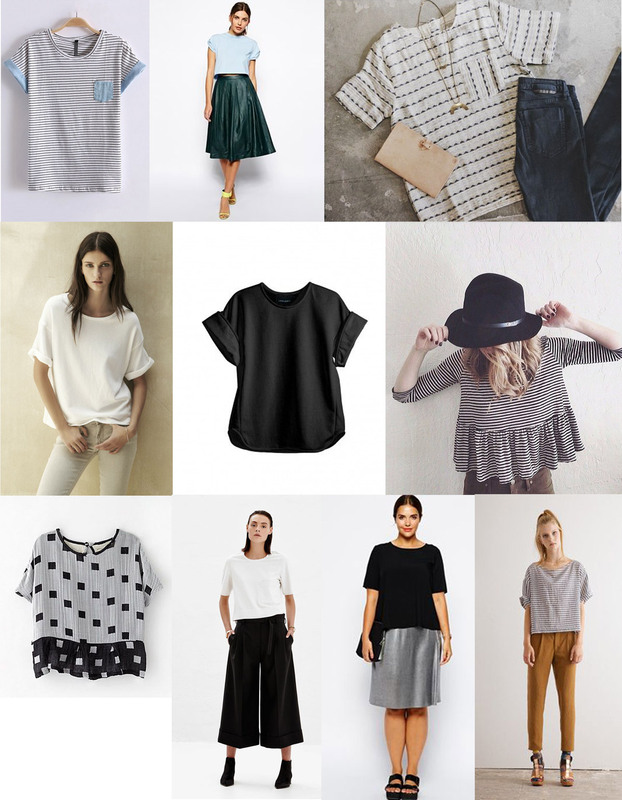 Boxy tee. Get it? 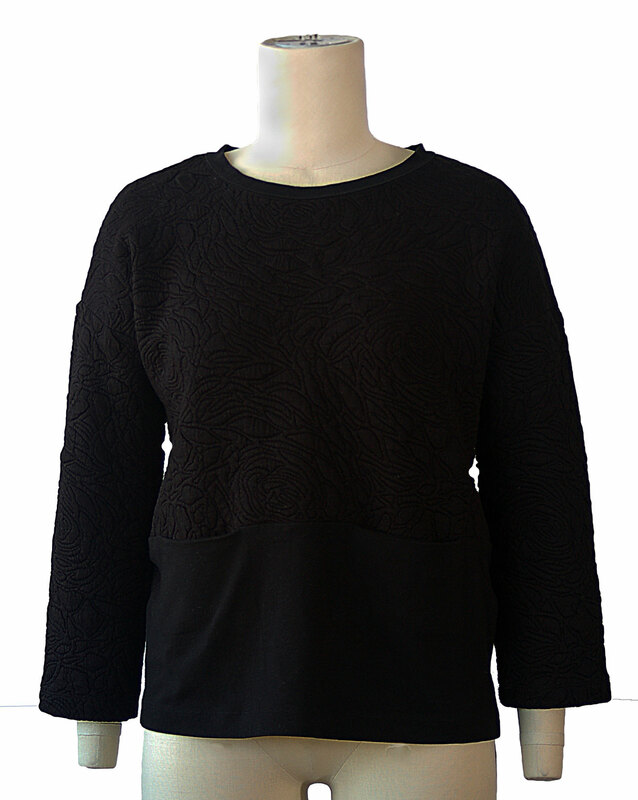 This pattern features a dropped shoulder with a slight kimono sleeve and a wider neckline. 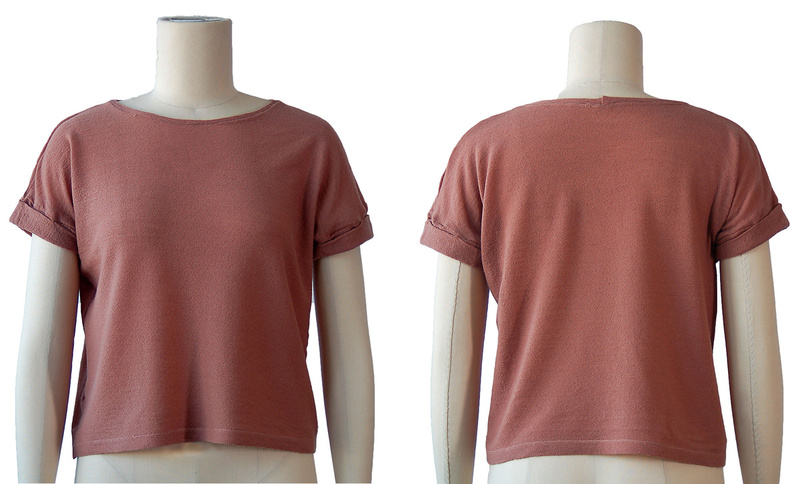 It’s not quite a bateau neckline, just a little wider and higher than our Metro Tee in order to give that boxy feel. It also includes three different sleeve options: long sleeves, three-quarter sleeves, and short sleeves with a cute little cuff. And, most importantly, it can be sewn with a basic un-seamed front and back or with a horizontal seam that includes two nearly-hidden in-seam pockets. This style is meant to be a bit cropped and wide, but not really over-sized. It’s just a little boxier than our Metro T-shirt. I prefer this style to be a couple of inches longer than waist length so it’s not too cropped. Also, if you want a truly over-sized style (which I sometimes do) this is a great pattern to use. You can get the over-sized look by making it a size or two larger than you usually wear. And, of course, if you prefer your tops to be longer (tucked in, perhaps?) you can always lengthen the pattern. I think it would be really cute worn that way. Believe it or not, this pattern also makes a great sweatshirt! I made the version in the photo above with a waffle knit, and I’ll be wearing it all fall with jeans, culottes, as well as with pencil skirts. This is a really easy pattern to sew. I think you’ll get a lot of use out of it. You’ll want to use a knit fabric for this style, but feel free to add woven details. You might also think about playing with color blocking for this style. And I especially like it in this quilted jersey that I found at B&J Fabrics. Styling ideas, anyone? Here you go. Remember when I talked about playing with design ease? This style is a good example of what I mean. 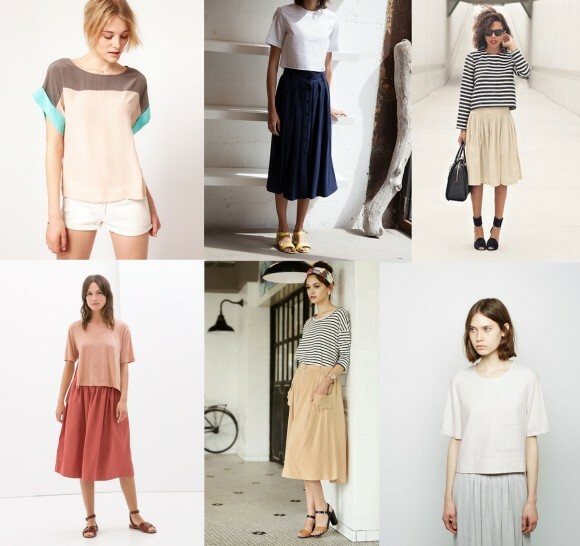 You can balance a loose fit with a tighter, body-conscious fit to create different silhouettes. I’ve added the images below, and many more, to my Liesl + Co Pattern Styling Ideas Pinterest board, where you can find inspiration for all our patterns. 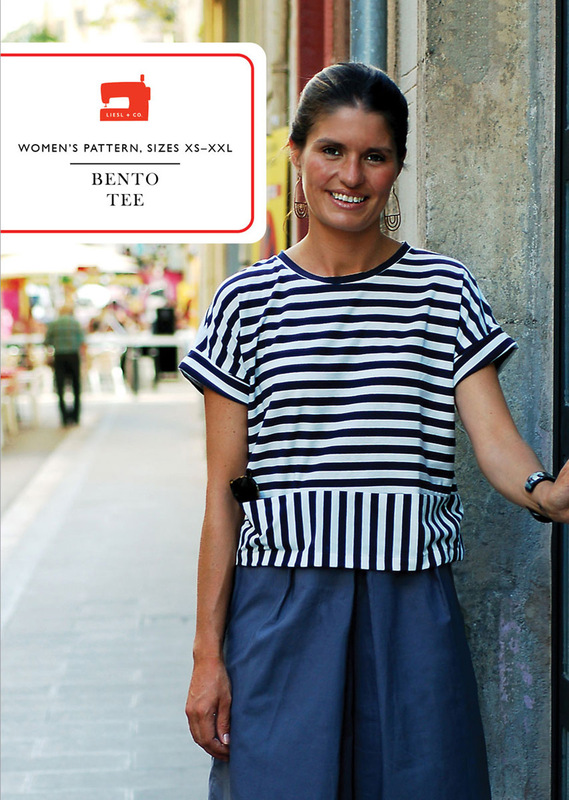 Are you getting some inspiration for the Bento Tee yet? I hope so! I’m looking forward to seeing how you sew it. Don’t forget to add your photos to the Liesl + Co Flickr group so we can see how it turns out! When I saw this last week with the Culottes I was hoping it was a new pattern. Yay! Love it. This top looks so comfy, and I love, love, love it in the quilted jersey fabric! Thanks for showing it to use in so many different looks! Even though I don’t sew knits much, I recently bought some heavier organic cotton / hemp knit fabric that doesn’t have a ton of stretch. I had no idea what to make with it, but this looks like it would be great in the longer sleeve version more as a sweatshirt! And the pockets are awesome. Love it! You read my mind. 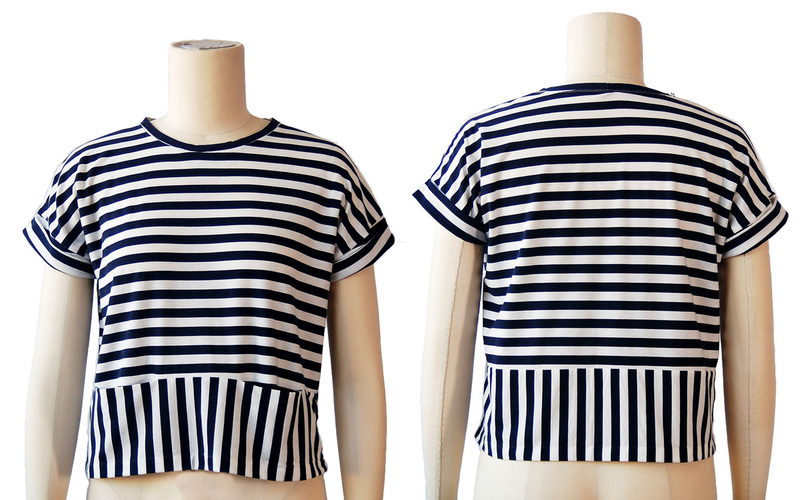 I’ve been dreaming of making a drop shouldered T in stripes with the long sleeve stripes perpendicular to the shoulder stripes. I was about to change up the Weekend Getaway but got sidetracked. You’ve saved me the trouble. Awesome!! I am hoping to lengthen this pattern and make a dress. Do you think it would work with a non-knit fabric?